With just FOUR more updates to go before I announce the winner, how are the portfolios doing in the Monkey Stocks League Challenge? Below is a snapshot as at the close of trading on 31st May 2016 and still way ahead of the pack was M’s Underdogs Fund! This ‘fund’ is still going strong, showing a gain of over 17%, although this is a drop from last month’s 30%! All May dividends have been added to the respective portfolios. However, please let me know if I’ve missed any (or if there are any errors) as there are so many to keep track of. 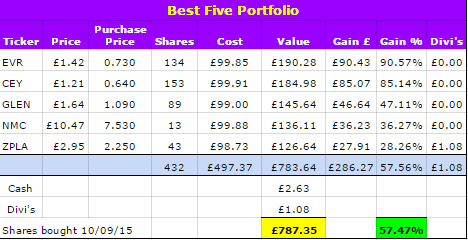 Of the real portfolios, behind the Underdogs Fund is my own Funky Monkey Fund. 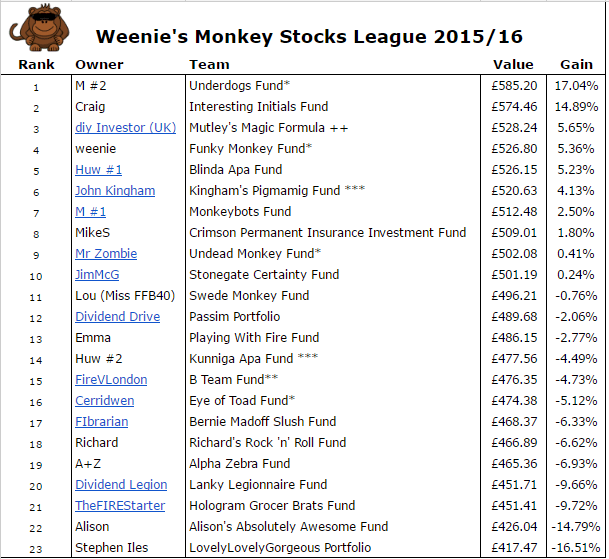 Mr Z’s Undead Monkey Fund falls but remains in the top 10, with FireVLondon’s B Team Fund and Cerridwen’s Eye of Toad Fund languishing in mid-table obscurity! John Kingham’s Pigmamig Fund drops out of the top 5, with Huw’s Kunniga Apa Funddropping to 14th place. Just four more months for either/both to finish above the monkey funds by the end of the competition! Some may have noticed that diy’s Mutley’s Magic Formula fund has been in and around the top 5 pretty much since the start of the league, making steady process. This fund is based on Vanguard’s 60% LifeStrategy Fund and appears to not bounce around as much as the funds made up of just 5 stocks. The best 5 performing shares since the start of the league are Evraz plc, Centamin plc, Glencore plc, NMC Health plc and Zoopla Property Group plc. The worst 5 performing shares were BBA Aviation plc, Barclays plc, Nostrum Oil & Gas plc, Poundland Group plc and Restaurant Group. 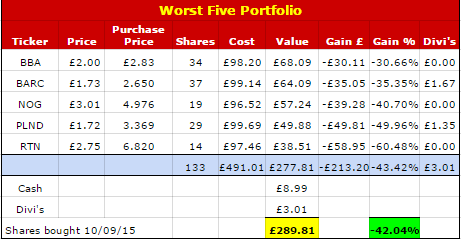 If you’d had the misfortune to pick this lot, you would have seen your portfolio value drop by 42% – ouch! Wonder how Brexit (or not) will affect the Monkey Stocks? This blog has been added to FI Assembly, which is an aggregator for FI/RE blogs – cheers Alex! G’ah, what a punishing month for the Undead Monkeys, tumbling from once arrogant grace! There is still time for a turnaround, Mr Z!